These low-fat squares are fruity and scrumptious. And they're fun, too—just watch people's reactions when you tell them it's a Healthy Living recipe! Stir boiling water into gelatin in large bowl at least 2 minutes until completely dissolved. Drain pineapple, reserving juice. Add enough ice to juice to measure 1-1/2 cups. Add to gelatin; stir until ice is completely melted. Refrigerate about 45 minutes or until slightly thickened. Remove 1-1/2 cups of the gelatin; stir in pineapple. Add 1/2 of the whipped topping to remaining gelatin; stir with wire whisk until well blended. Pour into 9-inch square dish. Refrigerate about 15 minutes until set but not firm. Carefully spoon fruited gelatin over creamy layer in dish. Refrigerate at least 3 hours or until firm. Cut into squares. Serve topped with remaining whipped topping. 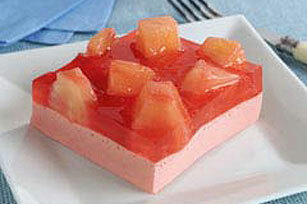 Prepare as directed, using JELL-O Strawberry Flavor Gelatin and COOL WHIP Whipped Topping.